Too Easy Travel vehicles offer you the peace of mind while traveling through the demanding Australian landscape. While travelling thousands of kilometers along your road trip you definitely want a reliable car and immediate help in case of an emergency. Buying a car from a private seller will not guarantee you that! Travelling with Too Easy Travel vehicles will give you the peace of mind you are looking for! We were backpackers like you and have done plenty of road trips through Australia, New Zealand, Canada and many more countries. At Too Easy Travel we understand your needs and that it can sometimes be difficult to understand the registration process and transfer of ownership. That is why we help all our customers with any paperwork that needs to be filled out and submitted and answer any related question you might have. 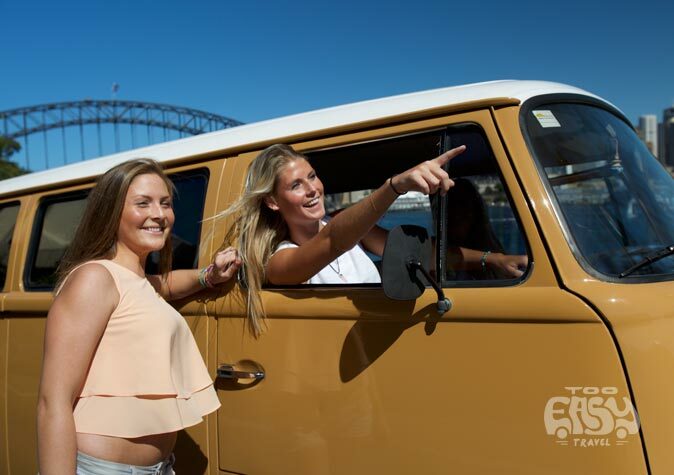 From backpackers for backpackers: We are a knowledgeable service team with a passion in providing our customers everything for the perfect Australian road trip. We have a large range of quality vehicles to best suit what you are looking for at an affordable price! We are qualified professionals that best assist you with finding the right car for your perfect Australian adventure and any questions along the way. Our cars are mechanically checked and fully serviced, to ensure they are perfectly sound. Our cars are fitted with the essentials that best suit your needs. We provide you with 1 year 24/7 Roadside Assistance membership with NRMA. We can assist you with the car registration and even help you to extend the registration. We help you with any legal papers that need to be completed relating to your vehicle. We speak your language: French, German, Spanish and of course English!